Fibre Channel is the most well known dedicated storage networking protocol in use in data centers today, and is considered the gold standard for storage in terms of availability, reliability, and scalability. However, it does require some specific design and planning requirements. For that, storage administrators use the Fibre Channel Speedmap in order to plan. - Why do storage administrators use the Speedmap? - What’s the difference between throughput, bandwidth, baud rates, and speed? - Why does this matter for Fibre Channel and not, say, Ethernet? 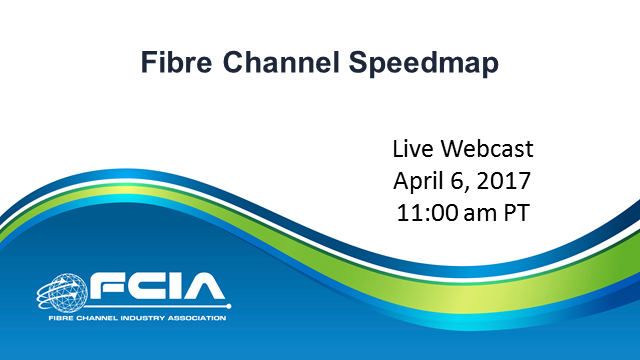 This live webcast will be useful for anyone who wants to separate the wheat from the chaff when it comes to “speeds and feeds,” and make sense of the numbers. Flash is really fast, and performance-hungry applications must be able to access it wherever it is located. Luckily, NVMe can take advantage of flash throughout a computer system. However, accessing flash over a network can introduce problems which designers must solve. Accesses can take much longer than local flash, latency can rise significantly, networking issues can raise their ugly heads, and performance can vary greatly depending on network load and competition for resources. Ways to solve such problems include sequence-level error recovery, prioritization for virtualized environments, and improved forward error correction. And – surprise! – all these are already part of the Fibre Channel standard or the emerging FC-NVMe transport protocol. Panelists: Craig Carlson, Senior Technologist, Marvell Semiconductor, Rupin Mohan, Director, R&D, Head of Development, Chief Technologist (SAN), HPE, David J. Rodgers, Sr. Product Marketing Manager, Teledyne LeCroy PSG, Marcus Thordal, Principal Solution Architect, Broadcom and Dennis Martin, Senior Analyst, Principled Technologies. The driving force behind adopting new tools and processes in test and measurement practices is the desire to understand, predict, and mitigate the impact of Sick but not Dead (SBND) conditions in datacenter fabrics. The growth and centralization of mission critical datacenter SAN environments has exposed the fact that many small yet seemingly insignificant problems have the potential of becoming large scale and impactful events, unless properly contained or controlled. Root cause analysis requirements now encompass all layers of the fabric architecture, and new storage protocols that usurp the traditional network stack (i.e. FCoE, iWARP, NVMe over Fabrics, etc.) for purposes of expedited data delivery place additional analytical demands on the datacenter manager. To be sure, all tools have limitations in their effectiveness and areas of coverage, so a well-constructed “collage” of best practices and effective and efficient analysis tools must be developed. To that end, recognizing and reducing the effect of those limitations is essential. Today's Fibre Channel SANs are tasked with reliably delivering huge amounts of data with almost zero latency in an environment with a large variance of end device capabilities. Fibre Channel is a lossless network protocol but what ramifications does that have? What is considered a good SAN design and what are best practices? What situations can lead to suboptimal performance? How can a device that is not performing well affect the performance of devices even on different parts of the SAN? Can a device that is returning credits without delay affect the SAN just like a device that is returning credits slowly? Fibre Channel (FC) is the storage networking protocol for enterprise data centers, with over 11 million ports deployed. Fibre Channel is purpose-built –and engineered to meet the demands for enterprise data centers that require rock solid reliability, high performance and scalability. It can even transport new storage protocols like NVMe natively. Flexible and resilient, Fibre Channel frames can be encapsulated in both an IP packet (FCIP) as well as a Layer 2 frame (FCoE) and provide unparalleled performance for storage systems. Even so, many people don’t actually understand how it works. This live webcast will help you understand the basics so that you can make informed decisions yourself. - What is Fibre Channel? - What makes Fibre Channel so reliable? - How is Fibre Channel different from other storage protocols? - What are the best practices for designing Fibre Channel solutions? If you’re not familiar with Fibre Channel and want to learn more, or if you are interested in learning about how Fibre Channel is purpose-built for storage and future proofed for next-gen NVMe storage arrays, join us at this live event. Our experts will be available to answer your specific questions on the spot. NVMe is one of the most interesting new developments to happen to storage in the past several years, and NVMe over Fabrics extends these capabilities over a Storage Area Network. Given that 80% of all existing Flash storage solutions deployed are interconnected with Fibre Channel (FC), many questions have arisen about what it is, how it works, and why someone might want to consider using Fibre Channel for NVMe-based solutions. - How does Fibre Channel and NVMe work together? - How is NVMe over Fabrics different from “traditional” Fibre Channel? - What changes do I have to make to my Fibre Channel environment in order to get NVMe over Fabrics to work? - What would an NVMe over Fibre Channel (FC-NVMe) architecture look like? - What advantages would I get using Fibre Channel in an NVMe solution? Check out this live webinar to learn more about this exciting new technology from the people who are developing it. The Fibre Channel Industry Association (FCIA) is a non-profit international organization whose sole purpose is to act as the independent technology and marketing voice of the Fibre Channel industry. We are committed to helping member organizations promote and position Fibre Channel, and to providing a focal point for Fibre Channel information, standards advocacy, and education. FCIA members include manufacturers, system integrators, developers, vendors, industry professionals, and end users. Our member-led working groups and committees focus on creating and championing the Fibre Channel technology roadmaps, targeting applications that include data storage, video, networking, and storage area network (SAN) management.